For many Americans, Thanksgiving signals the true beginning of the holiday season. Gathering the family together, enjoying a hearty meal, napping on the couch — these are all common customs on Thanksgiving Day, and for many, make the holiday particularly special. With roots in our unique American history, along with a variety of regional harvest celebrations, Thanksgiving is a grand holiday with a rich history of tradition. And that’s just one of the reasons we’re counting down the days to November 28. Another one is pumpkin pie. 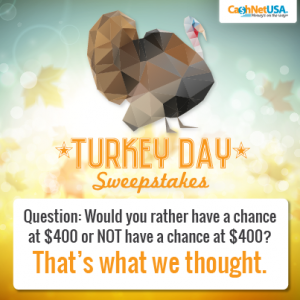 This season of giving, CashNetUSA is eagerly taking part in the festivities with the creation of the Turkey Day Sweepstakes. The sweepstakes was created to reward our customers for being a part of the CashNetUSA family. We appreciate how dedicated so many of our customers are in keeping up with CashNetUSA events, news and offers, and we pride ourselves on maintaining a special relationship with as many of them as we can. Engaging with our customers and followers is more than just good business — it’s a part of who we are as a company. The Turkey Day Sweepstakes will run from November 13 to November 26, and winners will be announced on December 2. The premise is simple: Enter your name on the CashNetUSA Facebook page for a chance to win $400. Two winners will be chosen randomly from all the entrants, but there’s a twist! 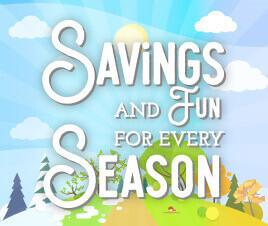 For every friend you refer to the sweepstakes who signs up, your name will be entered again! So, if you get Jim, Jane, Joe and Jillian to join the fun, your name will be entered five total times (including your own entry)! To put it simply, the more friends you bring in, the more chances you’ll have at $400. It’s not a coincidence that we’ve timed this event to line up with Thanksgiving. This is a holiday with a focus on tradition, and at CashNetUSA, we’re always eager to create traditions that our customers can look forward to. It may not be your grandmother’s famous green beans, but the Turkey Day Sweepstakes is sure to be a fun event for all, and we hope to make it a continuing element in our yearly events and contests. So keep your eyes peeled next year at this time. If enough members of our CashNetUSA family take part, there’s a good chance we’ll be back for another Turkey Day Sweepstakes in 2014. And don’t forget to enter this year for a chance to win $400! Happy Turkey Day from CashNetUSA!